Billy TK Jnr, White Ribbon’s newest Ambassador, will take the White Ribbon campaign on tour with him as part of the promotion of his new album ‘Billy TK Jnr and the Groove Shakers Blues Benediction’. “Being appointed as an Ambassador for the White Ribbon campaign is a very real honour, and I’m thrilled to be able to use the album release and tour as a vehicle to promote the White Ribbon campaign,” says Billy. “What an awesome opportunity to spread the message that violence against women is not acceptable”. Hailing from Aotearoa New Zealand, Billy TK Jnr has toured internationally since 1993 and has earned himself a reputation as a genuine guitar hero in the electric guitar blues scene as well as having video hits with ‘mainstream’ songs. Billy has worked with artists like George Thorogood, Jimmy Barnes, The Neville Brothers, Ian Moss and Junior Wells, and has performed in the USA, Japan, Australia and around the pacific. 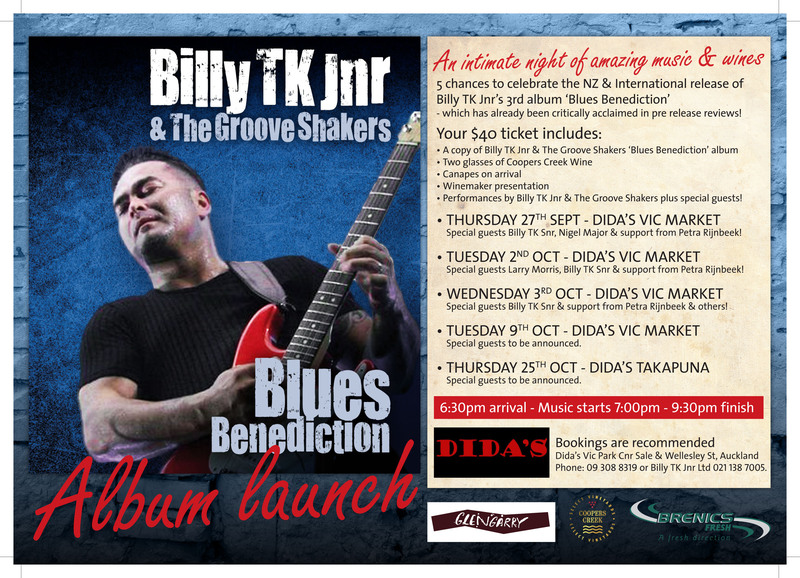 Over the next three months, Billy TK Jnr with the Groove Shakers’ are taking their Blues Benediction Tour and the White Ribbon message to venues across New Zealand and Australia, including a headline act at the Sydney Blues Festival.